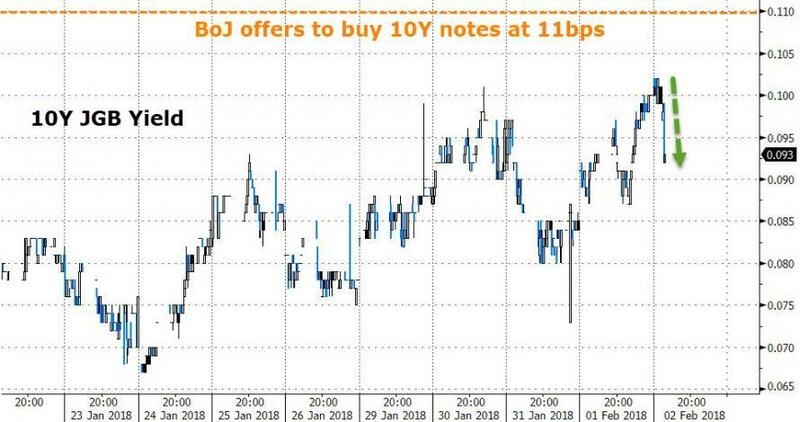 Whammy 1 - BoJ offers to buy unlimited 10Y notes at 11bps. Result - a 0.5bps drop in the JGB yield!! 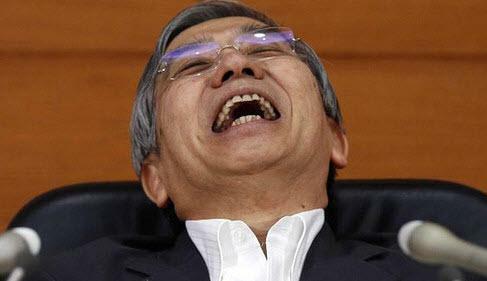 Whammy 2 - BoJ increasese its usual POMO to 450 billion yen from 410 billion in the 5Y and 10Y range of the curve. Result: a very brief weakening of the JPY followed by a 'policy error-like' drop in USDJPY as the Yen spiked now that the market demands even more. This is not the result Kuroda and his cronies were hoping for. As Barclays' rates strategist predicted, similar operations are likely in future if yields rise, warning that while the BOJ’s action can offer some relief to markets but the real cause of yield rise is higher U.S. yields, where prospects are unclear. He is right, because the USDJPY is already back to unchanged. 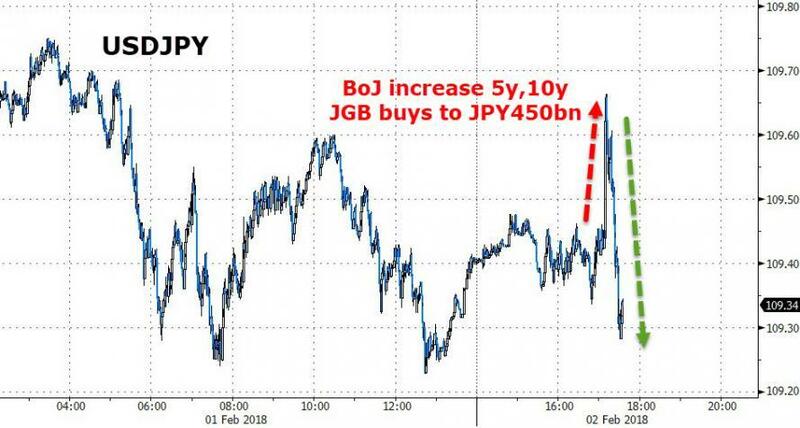 If and when the 10Y resumes blowing out, the BOJ will be forced to get even more aggressively involved as the spillover effects from rising US yields are finally appreciated by the rest of the world. But the last words belong to Yasutoshi Nagai, chief economist at Daiwa Securities, who said that "it’s a clear message from the Bank of Japan,” after the central bank announced a fixed-rate bond purchasing operation and offered to buy more of 5-to-10 year bonds at their regular operation Friday. "The message is they’ll absolutely make sure that long-term yields don’t go above 0.11 percent." And the punchline: "Right now the BOJ is nearing major personnel changes, so it doesn’t want the market to disintegrate." And that, ladies and gents, is your price stability.